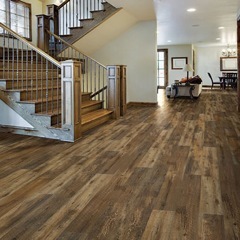 Luxury Vinyl Tile (LVT) is the fastest growing segment in the flooring industry for many reasons. Many styles of LVT looks like wood so much so that you really have to look at it closely to determine if it is LVT or wood. You can also purchase LVT that looks just like tile. LVT is a very versatile product and can be used in any room in the home. The newest LVT product has a water proof core. This is very popular for bathrooms and kitchens because it is water proof and you can just wipe up spills without worries. It is also becoming very popular in businesses because of its versatility. People are using LVT in their homes instead of hardwood and tile as it is much easier, faster and cheaper to install. Ease of maintenance. You can just sweep up dirt from the LVT or wipe it down. LVT is extremely durable, especially the thicker styles designed for businesses or higher traffic areas. LVT can hide sub floor imperfections. Most LVT has a sound mitigating underlayment. LVT is great in basements as you can put it right over the concrete flooring. LVT is warmer to walk on than tile so it is more comfortable in the winter months. Glue down which is glued directly to the sub flooring or concrete. Floating or tongue and groove which clicks together. This style is pretty easy and quick to install with minimal clean up. Cost for LVT is typically $1.50 to $4.00 a foot based on the wear layers and design. The thicker the product the more the cost as it is heavier duty and it will last longer. A water proof core is also a factor. Installation costs will vary based on the type of LVT chosen. The other factors include the floor preparation involved and if you have base molding that needs to be removed and reinstalled.